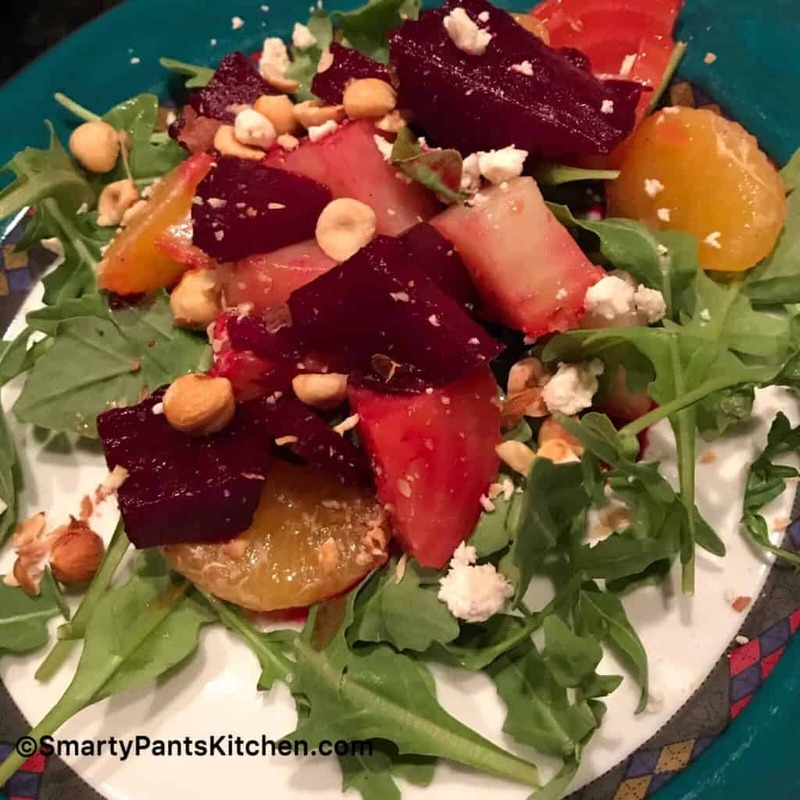 This beet salad will convince your taste buds how juicy and delicious beets can be! Sweet, tangy, savory, crunchy and spicy, this salad has it all and is perfect year-round. The image of the beets above are Chioggia beets. When sliced, they are red and white striped and have a sweeter taste than the red, golden or white beet. The Chioggia beet hails from Chioggia, Italy and can be found in most specialty supermarkets. In culinary circles, you’ll find chef’s refer to them as “Candy Stripe” beets. This recipe calls for roasting beets, however, if you don’t have time to roast them, just used canned beets. Try not to get “pickled” beets or any that contain sugar or preservatives. As for the Chioggia beet, you’ll be hard-pressed to find it canned–usually it’s at your local Whole Foods Market, or other grocer that carries unique fruits and vegetables. Outside of the spicy arugula, sweet beets, crunchy roasted hazelnuts and creamy feta, the salad dressing is what sets this salad apart from others. 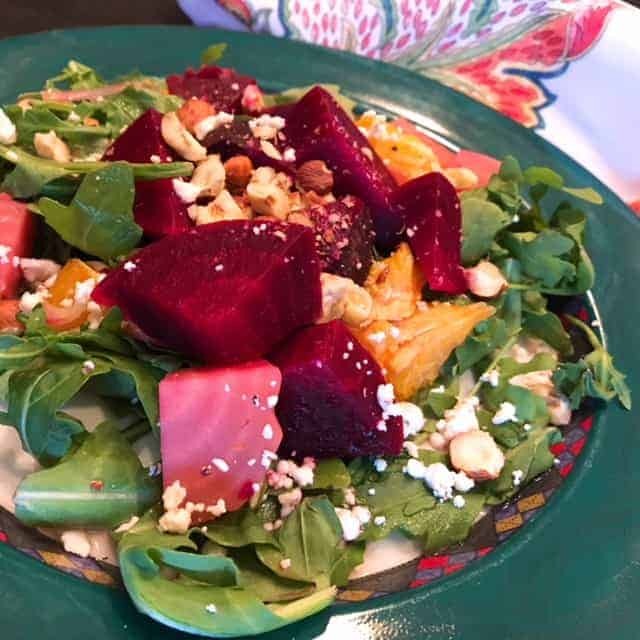 It’s a mild combination White Raspberry Balsamic Vinegar, malt vinegar (or red wine vinegar), sugar and a pinch of salt when combined, set the flavor of this salad over the top! If your grocer doesn’t carry White Raspberry Balsamic Vinegar, feel free to contact The Grapevine Olive Oil Company and they can send you some! They’ve got oils and vinegars infused with raspberry, chocolate, garlic–you name it! They carry both imported and domestic products so be sure and check them out!